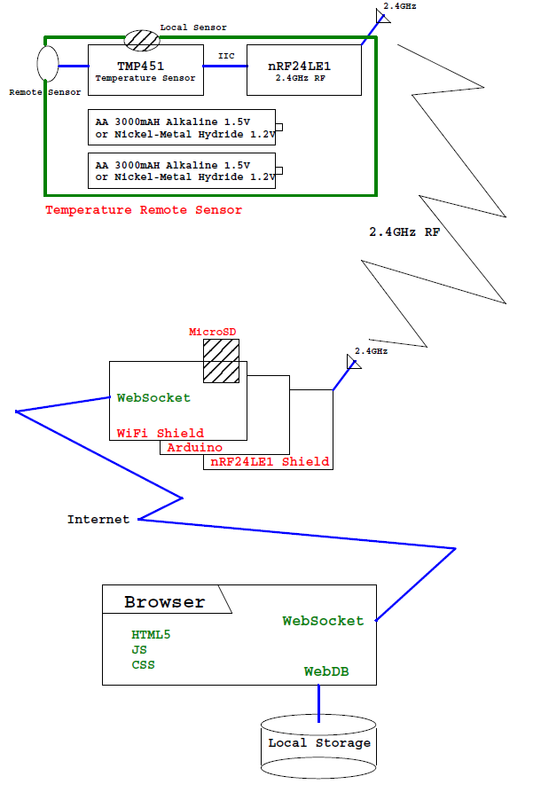 There is not much difference from Components - Arduino Web Logger posting after adding Arduino. Ethernet Shield has been replaced for WiFi Shield and RS-485 Shield is replaced by nRF24LE1 Shield. Let's focus on Temperature Remote Sensor. It is composed of 3 parts. I'm going to use TMP451 from TI. If you look at Power, it doesn't exceed 500 uA. This is perfect for Battery. I'm going to use nRF24LE1 from Nordic. This is the chip that has been used in wireless mouse, keyboard, and remote controller for long time. For this model, you can program internal 8051, thus you don't need additional Controller. Power ranges from 1.9 V - 3.6 V, which is perfect for battery. I assume the price will be perfect also. However, power consumption rate could be a bit better. If we add more peripherals it will exceed 20 mA. I am wanting Battery that will last at least a year. We are going to use it once in every 10 minutes and it will be used for 10 seconds using 20 mA. Thus we need Battery with size 3000 mAH. 3000 mAH is very common in AA size batteries now. In Alkaline, DURACELL Normal or Energizer will be good enough. However, the size of AA is not that small. Thus the size of remote sensor will be the size of AA battery. Of course the weight will be the same as AA battery.